Gateway Rasmussen utilizes state of the art digital production technology that can handle both short and long run projects. Our talented graphic design team is here to help you make your project the best it can be. We use quality materials and workmanship to produce the most attractive and durable cookbook possible – one that you will be proud to share with your family and friends! Online recipe submission makes input and project coordination simple. We only charge for the actual number of pages printed - saving you money! 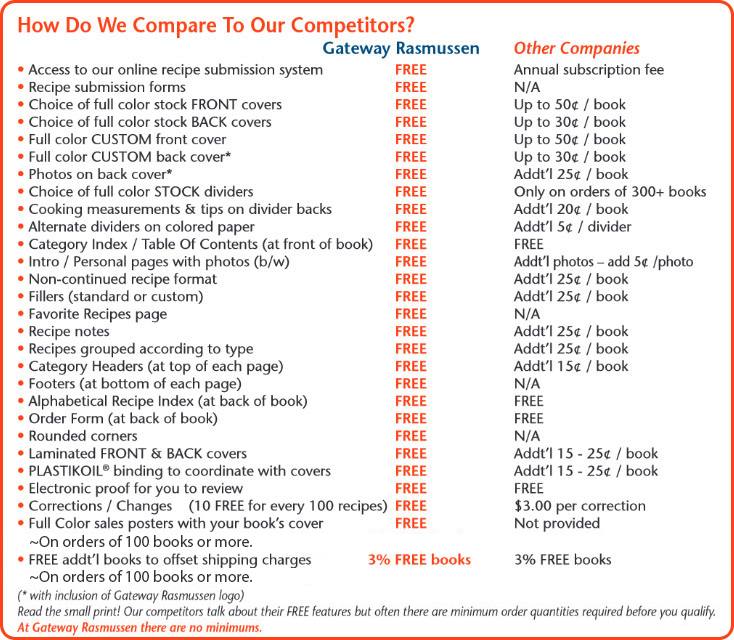 We don’t generalize like our competitors with minimum/maximum recipe estimates. Custom full color covers are our specialty! We help you create a beautiful full color cover at no extra charge. Personalize with family photos, your organization’s logo, or any image or text that reflects the spirit of your cookbook project. 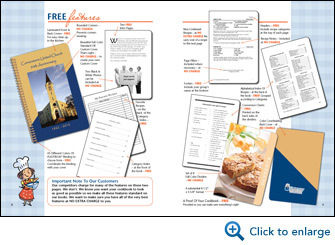 We also offer a beautiful array of full color stock covers and dividers for you to choose from. Laminated covers and rounded corners give our books a beautiful durable finish. A substantial 8-1/2" x 5-5/8" format with easy to read type. A good size that effectively conveys your group's message but convenient enough to fit on the kitchen counter while cooking. Plastikoil® plastic spiral binding lets the finished book lay flat or open a full 360 degrees from cover-to-cover (a handy feature when counter space is limited). Plastikoil® is also available in 45 different colors so matching your cover to the binding is never a problem. Our books are value-packed with a multitude of additional standard features like weights & measurements, spice guides, substitutes and equivalents, and the list goes on - all for no extra charge. Our established and extensive shipping services can be utilized to ship your cookbooks to multiple locations - no problem. We always use the most effective, cost efficient method to ship your books. 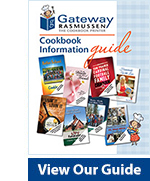 We send you 3% FREE cookbooks which you can sell to help defray shipping charges. Personalized Full Color Sales Posters included FREE with every order. Your actual cookbook front cover is featured on the posters to help you sell even more books! 2 FREE posters with every 100 books ordered. We offer flexible payment terms, with no down payment being required for recognized non-profit organizations. Our experienced customer service team is always just a phone call away from offering you 'hand held' support - from start to finish!